Shanghai | Adventuring Towards . . .
Jandira and I had agreed to meet again on Monday morning, so I took the subway out to the French Concession. For the second time on this trip, the Shanghai Subway threw me for a loop. They translate almost everything on their signs but, just for fun, leave out the really really important information. “Line 10 hasn’t been constructed yet”, for instance, or “Exits 6-8 can only be accessed from Line 7, not Line 1”. While I can read Chinese, I don’t when there’s English available . . . Thus, we had a hard time meeting up but eventually managed it. The museum was pretty cool, though. I was glad they had English translations because my Chinese actually wasn’t much use. In addition to the traditional characters, I’m not really up on my socialist thought vocabulary – we haven’t covered “proletariat”, “revolutionary”, or “imperialism” yet in class. 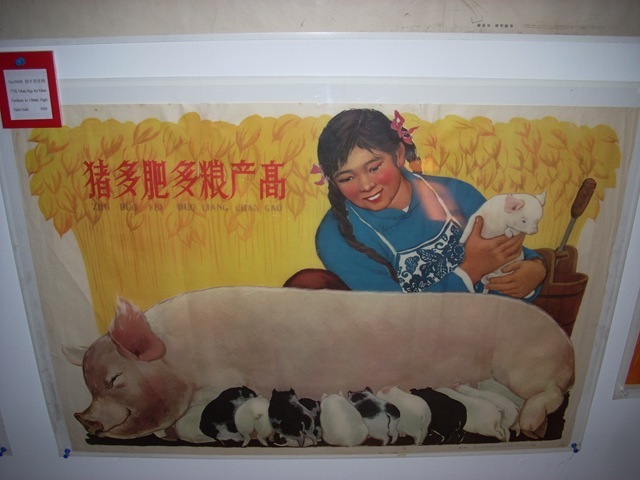 This was my favorite one: “More pigs for more fertilizer for higher grain production”. We had lunch in a Western cafe and then – via two subway lines and a taxi – went to the airport. The flight back was fine, and then I was home in Xiamen. 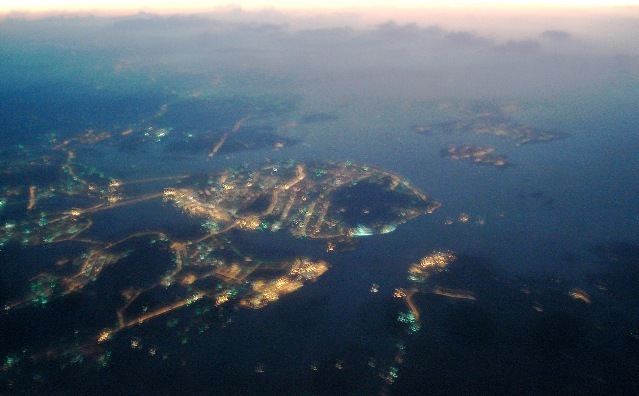 I didn’t have a window seat, but this seems like a good time to post a picture of Xiamen from the air. It was taken by a friend of my mother, a pilot, as he flow over a few months ago. Isn’t my island pretty? The last time I had flown into that airport, I took a taxi to campus because I was jetlagged and in an unfamiliar place. This time, neither being true, I decided to try taking the bus home. I looked at the routes, found one that would take me as far as ZhongShan Lu, and boarded the bus with a pleased smile on my face . . . Then, over a half hour later, when we arrived at SM (which is then an hour from campus), I gave up on the bus. For a small island, that airport sure is far away! But, I made it home and was even in time to have dinner with a friend. Back in my room, I had a lot to catch up on. The big international news is the conference on climate change in Copenhagen, and my Google Reader page was full of articles and blog posts. I have a couple of Udall friends attending the conference (you can read their blogs here and here if you’re interested), but there was also news from the Vatican (Pope Calls for Concrete Action on Climate) and even the Onion (EPA Warns of Rise in Global Heartwarming). As I unpacked and did other things around the room, I listened to Christmas music. It’s kind of cool not having Christmas music forced upon you every time you venture out or accidentally turn on a 24/7 all-Christmas-all-the-time radio station. I get to choose when I listen (not until Advent started, and only when I’m happy and calm) and what I listen to (no bad remakes of classics with too many notes crammed in). Also, while I miss home with its cold and snow – surefire signs of Christmas’ approach – I have a new understanding for a lot of songs that had been meaningless to me before: “I’m Dreaming of a White Christmas”, “I’ll Be Home for Christmas”, and even “Having a Tropical Christmas”. On Sunday morning I returned to St. Ignatius Cathedral, this time for the first Mass of one of the newly-ordained priests. I had trouble finding the entrance to the subway so I was a few minutes late, but got there just in time to [totally conspicuously] join the procession of priests and altar servers entering the church. While not as crowded as the day before, there were still a lot of people – whether they were the usual Sunday crowd or came for this priest, I don’t know. At the end of Mass, the priest’s older brother – who is also a priest – got up and addressed the congregation for a few minutes. They both expressed profuse thanks towards their father, who was in attendance. 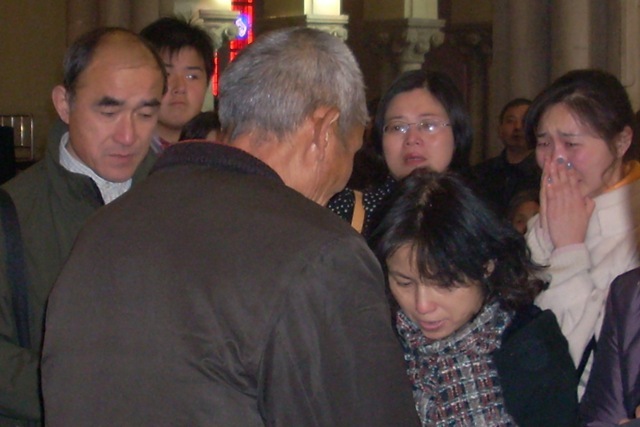 Then, once Mass was over, a crowd of people gathered around the father to hug him, shake his hands, and generally express congratulations and gratitude. Everyone was crying; it was really an incredible experience. I took the subway from the cathedral back to the Old City Town, where I had plans to meet my roommate’s sister. Leinira and Jandira came to China at the same time on the same scholarship to study different things at different universities. Anyway, we had some things to hand off to each other and I thought it would be cool to meet my 姐姐s 妹妹 (older sister’s younger sister). Anyway, the whole thing did not go as planned. Specifically – she arrived two hours late. I wasn’t expecting such a delay, so I spent the whole time standing around, not even exploring the nearby gardens or anything. I did get a Blizzard at a nearby DQ and eat a plate full of delicious 小笼包 (rice dumplings filled with ground pork and soup), but it was still largely a waste of the afternoon. When she finally got there, we had a drink together, looked around for some postcards, and then parted ways. I was tired and frustrated, so I went back to my hostel for a nap and some 洗头发 (hair-washing). 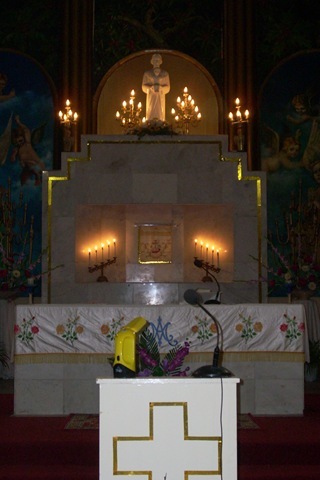 experienced a possible miracle at Our Lady of Sheshan! Like I said, it’s been a really good trip. I’m so glad I came because of the opportunities to make connections with some people from my church, as well as the indescribable experience of attending my first ordination Mass, of a deacon I know, in Chinese. Plus, Shanghai has some fall colors, which is just about what I needed now at the beginning of December. Also, traveling by myself has been a lot more fun than I expected. Until I met my American hostel-mates last night, I had spoken basically no English since Wednesday night, but I’ve had a lot of opportunities to speak Chinese. Anyway, like I said, I’m off to Mass. 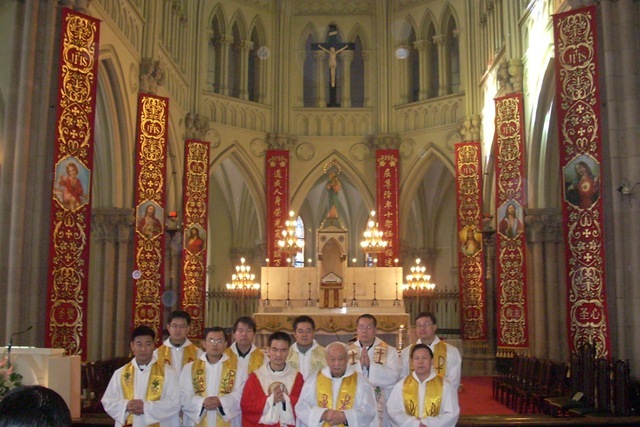 Father Zhao – formerly Deacon Zhao – told me that one of the newly-ordained priests is celebrating his first Mass this morning at 10, and I plan to be there. We had an early wakeup call and ate breakfast quickly before heading to nearby St. Ignatius Cathedral for the main event of the trip – the ordination. We got there just before 8 and the place was packed. I don’t mean ‘crowded’ or ‘full’ – I mean ‘packed’ in a way that I had, until now, only experienced on public transportation . . . in China . . . during rush hour. The ordination Mass didn’t start until 9, which meant an hour of musical pews. I can’t imagine that seats on the Titanic’s lifeboats were fought over more intensely; it was quite ridiculous. There was shoving and pushing and arguing and no one seemed to find this behavior out of line with the sacrament of unity we were about to celebrate. There were 12 deacons there to be ordained, and it largely fell to them to find places for their families, friends, and parishioners to sit. Even despite this unpleasant task, I was struck by the sense of peace and calm that they exuded. Out of all the people I’ve met in China, I think that the priests I know are the quietest, calmest, and most unassuming of them. In a country where everyone is striving to the loudest, you would think they would get drowned out and covered up, but in my opinion the opposite happens. Interesting . . . 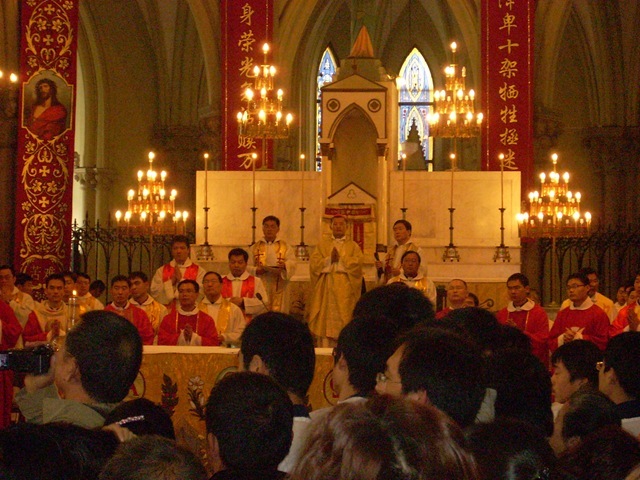 The Mass began with the entrance of the bishop (of Shanghai, I’m guessing), the deacons, and a ton of concelebrating priests. The ordination Mass lasted almost three hours. Unlike ‘normal’ Mass, which I’ve celebrated at least once a week for my entire life, I’ve never been to an ordination so I didn’t always know what was going on. 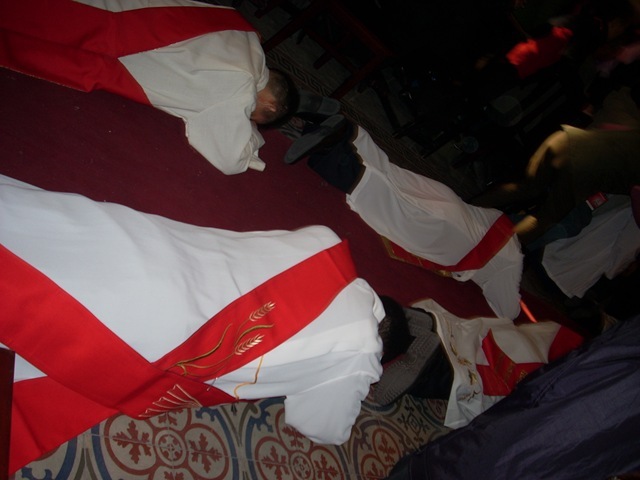 The deacons knelt before the bishop several times, and at one point lay prostrate on the ground. Once they were ordained, they came back to the pews where their families helped them put on their vestments. They hugged their family and friends and everyone was crying – happy tears, though. I got a hug from Father Zhao, too, and really felt like a part of the church. After that, it was time for the rest of the group to leave. They were all quite worried about me staying by myself and Father Zhao, who was staying for a few extra days, took it upon himself to ensure that I had a place to stay – just like a good shepherd. He tried his best to get me stay in a nearby hotel, but at 200 kuai a night, it couldn’t compare to the 45-kuai-per-night hostel I found. He settled for making sure I knew how to get there and sent me on my way. I managed the subway pretty well and found my hostel fairly easily. After dropping off my stuff, I walked a few blocks to Nanjing Lu for a stroll down the whole length. I really wanted some milktea, but everywhere I looked I saw Starbucks. I think that when Starbucks outnumber milktea shops, China has lost pretty much everything I love. At the other end of Nanjing Lu is 人民广场, or The People’s Square. 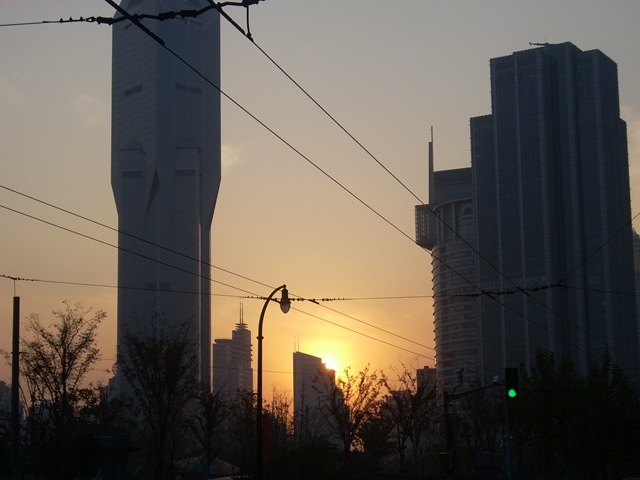 I met some friendly Chinese students who wanted to practice English and got to see a beautiful sunset disappear behind some skyscrapers. I took the metro from there under the river to Puxi (literally, “West of the Huangpu River”) where I had heard it was possible to get a boat ride on the Huangpu. I stopped a young man for directions and he ended up accompanying me in my search. His desire to help, while typical of Chinese, went even above and beyond what I was used to. We walked for at least half an hour down the riverside and crossed the river on a ferry before he saw me onto a boat and said goodbye. I was also fortunate enough to meet a tourist from Anhui who pleasantly chatted with me for most of the hour-long boat trip. I learned the word for captain – 船长! I was tired by the time I got back to my hostel, so I treated myself to a full-body massage. 70 minutes, 60 kuai ($9) . . . perfect end to a long day. 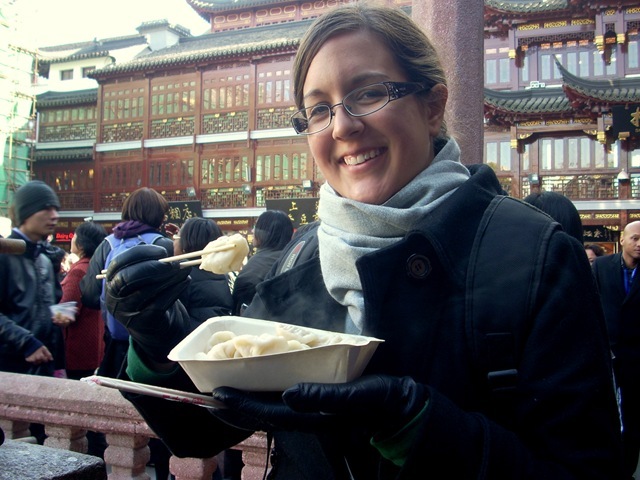 Friday began with breakfast – rice dumplings filled with meat, fried noodles, hard boiled eggs, tomato slices, etc. I had to laugh when my Chinese travel companions pointed out that I was eating Western breakfast. Oh, really?? On the first bus ride of the morning, after praying the Rosary, we had a sort of sing-along. They asked me to sing an American hymn but, to my utter embarrassment, I was unable to remember the words to any of my favorite hymns! This, coupled with my atrocious singing voice at 8 a.m., means that I am resolved to never let any of them know that I was once the choir director at my church. Oh, the shame. Our destination was Sheshan (literally, She Mountain). It is the highest mountain in Shanghai – that is, it’s really the only mountain in Shanghai, and frankly it’s quite generous to call it a mountain. It’s out in the suburbs of Shanghai – it was my first time seeing suburbs in China, but there were developments of identical single-family homes and everything! 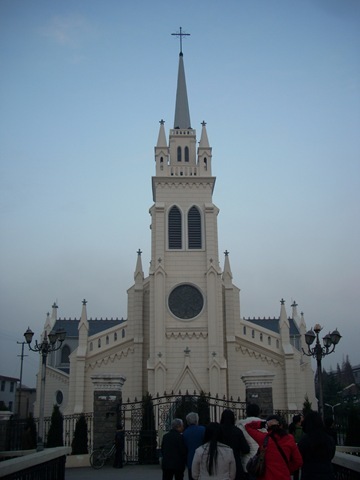 Anyway, the reason we were going there is because it is the site of the Sheshan Basilica, the only Catholic pilgrimage site in China. We drove to the bottom of the mountain and started climbing from there. The mountain really isn’t that tall, though, and we stopped at a church about halfway up. 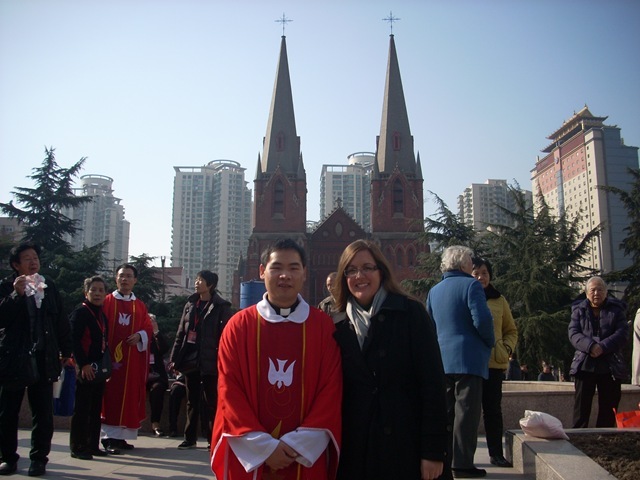 When we reached the church, I was excited to see a familiar face – Deacon Zhao, soon to be Father Zhao! 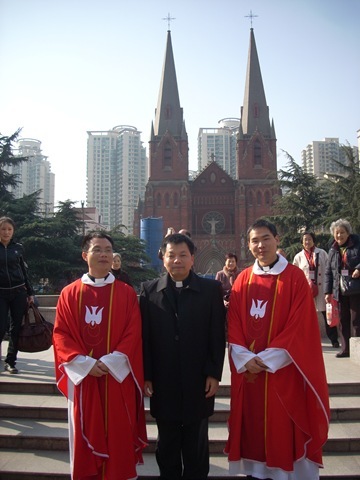 There was also another deacon from Xiamen who was also going to be ordained the next day. We celebrated Mass together, their last as deacons. We continued climbing after Mass, praying the Stations of the Cross along the way. We were using the Minnanhua prayer books, which is definitely a form of penance for me. Minnanhua makes my brain hurt – literally, there is a part of my brain that throbs in a fuzzy way when I try to follow Minnanhua. It’s better with the book because all of the dialects of Chinese theoretically use the same characters, but . . . as with all things relating to the Chinese language, it’s not actually that simple. The weirdest thing is that “you”, which is written 你 in Mandarin, is written 尔 in Minnanhua – which is also a character in Mandarin, but with totally different pronunciation and meaning. 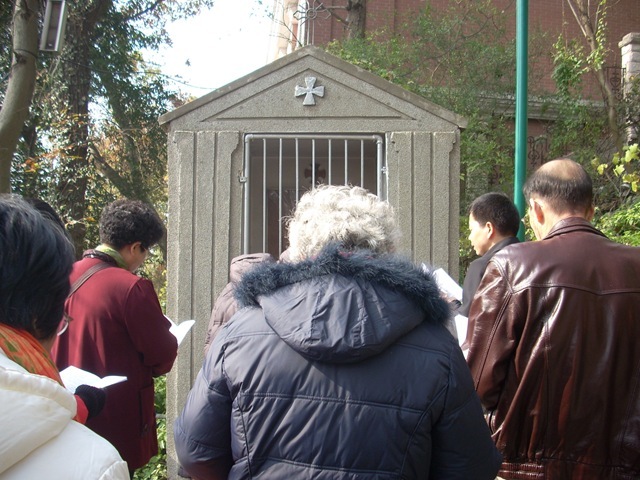 Anyway, as we prayed the Stations of the Cross, I had to look at the characters in the book, think of their sounds in Mandarin, and connect those to the sounds – at least sometimes similar – of the people around me praying in Minnanhua. At the same time, I had to look at the characters in the book, think of their meanings in Mandarin, and connect those to meanings and words in English. Like I said, Minnanhua makes my brain hurt. The basilica at the top of the mountain was under construction (like most of Shanghai and, for that matter, most of China), so I didn’t get to go in. There was, however, an outdoor area with statues of Joseph, Mary, and Jesus. I think I remember reading about the number of steps in temples according to the rank of the honoree, so I thought it was interesting to note the striking height difference between the three statues – Joseph had about three steps, while Jesus was almost a flight up. 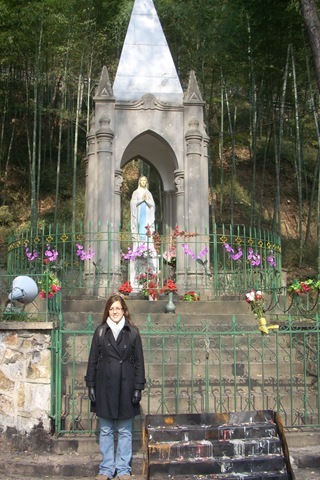 We had lunch in their cafeteria, which was the site of a possible miracle for Our Lady of Sheshan. The boxed lunches that we were given consisted of rice, cooked Chinese cabbage, and fish. Now, I don’t eat fish. I don’t like the taste, texture, smell – nothing. Thus, this lunch seemed to be a test of my willingness to try anything, my desire to be polite, and my plain-old hunger. But – miracle of miracles – I LIKED IT! It was crazy – I don’t mean that I tolerated it, or that I choked it down, or that I downed an inordinate amount of water during the meal – but I actually enjoyed the fish. This may sound silly to those of you who know of some of my eating exploits (dog, pig cartilage, fish eye, chicken foot and beak, etc.) but fish is still a really big hang-up for me. Anyway, I need to figure out exactly how this fish was prepared and try to duplicate this amazing event. After we came down from the mountain, we had a long bus ride to Pudong. Pudong (literally, “East of the HuangPu River”) is the huge financial and commercial center of Shanghai (and, pretty much, all of China). 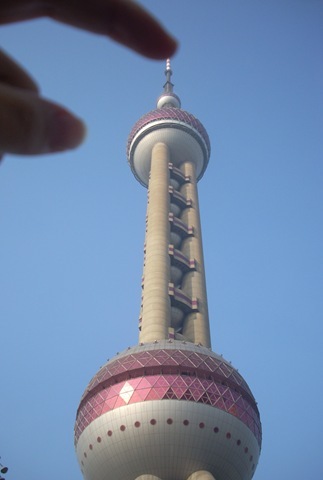 There are a lot of skyscrapers but only one worth seeing – the 东方明珠, or Oriental Pearl. Honestly, it is really ugly in the daylight – it’s a TV tower made almost entirely of concrete, with gaudy opalescent purple ‘pearls’. We took pictures anyway, then returned to the authentic Shanghai experience of rush hour. 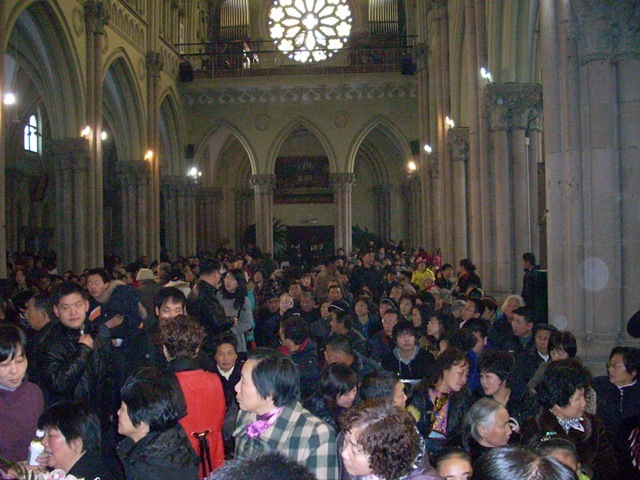 Our last stop of the day was Our Lady of Lourdes Church, Shanghai’s second most popular pilgrimage site. Then we had dinner and returned to our hotel/liquor store for the night. 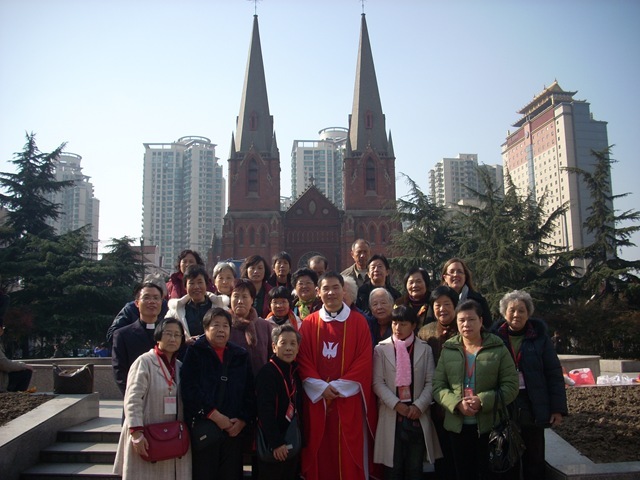 Thursday morning began early when I met my travel companions near the Xiamen church. 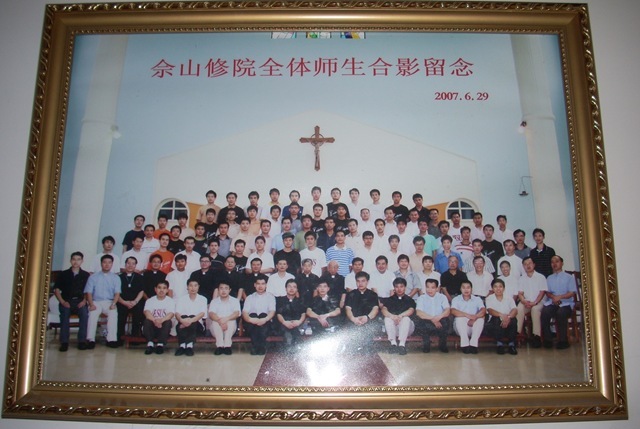 There were quite a lot of us, maybe 25 or 30, including one of the Xiamen priests, Fr. Cai. We took a bus to the airport and flew from there to Shanghai’s domestic airport, HongQiao. The flight was only an hour and a half but seemed long – I slept, ate some surprisingly good dessert-bread-thing (surprising both for China and an airplane!) 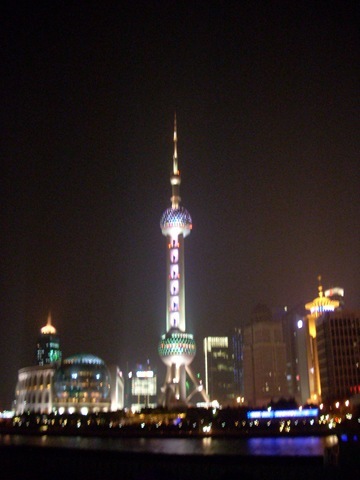 and read what Lonely Planet had to say about Shanghai. We were met at the airport by our tour guide, a strikingly large Chinese woman. (Every now and then, I understand why people stare at my gargantuan self; this woman was both taller and heavier than me and was impossible not to notice. Still, I didn’t stare.) We loaded onto a bus and she introduced Shanghai as we drove to lunch; I understood a lot of it. My ‘assigned seat’ on the bus is in the back corner; while it had a feeling of exile to it, I did appreciate the window seat. Shanghai has real trees (not just palm trees) and I liked looking at the leaves. It looked like fall which, while still a season behind home, is a season ahead of Xiamen. Lunch was interesting. I thought the restaurant seemed very nice, which in America would generally equate to even higher levels of cleanliness. But the old ladies were freaking me out, using the boiling tea to sterilize their bowls, cups, and spoons, before dumping the “dishwater” into their plates. This turned out to be a regular thing, and other restaurants even provided large bowls for disposal of the dirty water. It’s interesting because most of the restaurants I eat in provide tablewares in little sterilized packages, which seems incredibly wasteful and probably inefficient, but . . . maybe I’m underestimating the challenge of hygiene in this country. After lunch we went for another drive, this to Mass. There were no missals and the readings were different than the ones I was expecting, but I did okay. Afterwards, the priest (who was a classmate of our priest in seminary) introduced the church, telling us that it’s 150 years old and usually holds 300-400 people for Sunday Mass. The rest of the day was spent touring Shanghai, Chinese-style. Basically, this means long stretches of bus time punctuated by short stops at important sites for picture-taking. 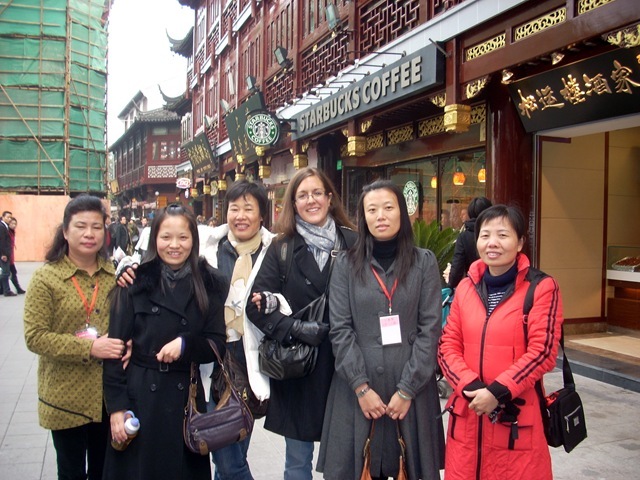 Our first stop was the Yuyuan Gardens in the Old City Town, where we took pictures in front of the authentic old-style architecture (and Starbucks). I had been feeling a little bit ignored up to this point but as soon as the cameras came out, I – the token foreigner – became the most popular thing since seaweed-flavored anything. They started to warm up to me; the physical proximity required for photos helped, as did their realization that I speak Mandarin. I would have thought it was obvious that I spoke at least a little bit of Mandarin, but then again I also would have thought it fairly obvious that I was Catholic. Neither of these were apparent enough to my travel companions, though, and I was asked a disconcerting number of times if I believed in Jesus. No, I just figured it would be great fun to tour Shanghai with a bunch of grandparents . . . The next stop was Nanjing Lu, which is the main shopping road in Shanghai. Apparently I didn’t take any pictures of the street itself – I fail as a Chinese tourist! 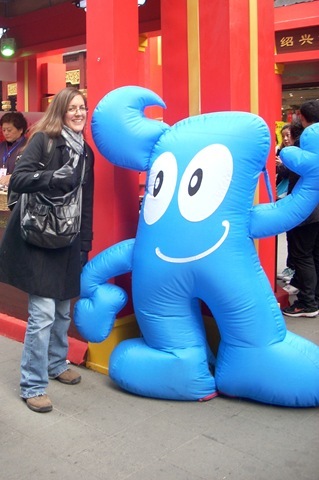 But I did get a picture of me with Shanghai’s most famous resident – Haibao. He’s the mascot for the upcoming 2010 Shanghai World Expo, which is kind of a big deal. Half of the city is under construction for the expo, and the other half is covered either with images of Haibao or with vendors selling stuffed Haibaos and Haibao keychains. Dinner was great. As soon as I realized that touring with Chinese people meant eating with Chinese people, I was a little bit afraid . . . I love Chinese food, don’t get me wrong, but not all of it. When Chinese people go out for a nice dinner, they usually order dishes that I would serve to my dog (after removing the pork bones). Anyway, I was pleasantly surprised by the food on this trip. Yes, there were more bones on the table than I personally would have preferred, but it certainly could have been worse. There were excellent meatballs, good potatoes, delicious rice, curry, and a dessert of sugar cane. Speaking of sugar cane: This is one of those dishes, not few in China – that require the removal of undesirable parts from the mouth as part of the eating process. This is how the Chinese cope with bones, fat, gristle, seeds, etc. in their food – by simply spitting it out. This is already weird to Americans but it gets worse – they spit it out on the table. While I do spit things out occasionally now, I am resigned to being a foreigner and use my plate, trying not to think about the generations of Chinese who have used the table. Anyway, it’s not just spitting that is acceptable here. You can pick your ears and nose, AND you can examine the fruits of your search afterwards! You can speak with your mouth full; it’s okay. I also discovered at dinner that you can sip some tea, swish and gargle a bit, and then spit it back into your soup bowl. But if you’re going to use a toothpick, please cover your mouth while doing so. No one wants to see that, okay? Gross. After dinner, we went back to the 酒店. Yes, the place we were sleeping is literally called a “liquor store”. I just recently learned it is also the word for a nice hotel, which means the enormous glittering 酒店 sign near ZhongShanLu makes more sense. Anyway, I find it funny. My roommate is Cai 修女, or Sister Cai – she’s a nun! I took advantage of my captive audience to ask some burning questions and found out that the chant-like prayer they say is indeed the Rosary but is not in Mandarin. It’s in Minnanhua, the local dialect of my province, which explains why I was not able to understand anything except “Mary” and “Jesus”. Come to think of it, despite having the text of the Hail Mary in Mandarin, I’ve never actually heard anyone say it. I think I may just try to learn it in Minnanhua, which would at least be handy for the next 8 months or so. Also, the prayer books that they brought along for the pilgrimage, which I was so excited to receive, are also in Minnanhua – fail. The best way (sometimes the only way) for me to stay awake during class is to eat. Recently the snack of choice has been these excellent orange gummy snacks that I found at the supermarket, but today I tried something new. A friend pointed out a different flavor of Oreos that I hadn’t tried before – Lightly Sweet. It’s so typical; America has Double-Stuffed Oreos and China, whose main sweetener is red bean paste, has Lightly Sweet Oreos. Anyway, the cream filling is almost identical to the original in texture, but has basically no flavor. The cookies, which are my favorite part, are still sweet, so I actually think they’re pretty good. I’m just a little hesitant because, while I know that pure sugar is not the most healthy thing to be eating, it might be better than the mysterious non-sweet pasty substance used in China’s Lightly Sweet Oreos. After class, I went to finish my shopping. I first went to check out a new store by West Gate that was rumored to have large sizes – even for people as big as ME. I know, right? Anyway, this Meters/Bonwe place is amazing. They had nice-looking clothes, and even had the gargantuan sizes that I require. I bought a super cute jacket that was on sale for 60% and, even more incredibly, found a pair of pants that I fit into. This victory came as I tried on the third pair of successively larger pants, starting with one that she describes as “very big”. Seriously, China is enough to give anyone an eating disorder. I didn’t find a cheaper or better-looking winter coat, so I went back to ZhongShan Lu for the one I had looked at yesterday. With so much of the leg work out of the way yesterday, today’s shopping was almost a joy. It was a freakishly beautiful day today – I believe we broke 70 F – so I really enjoyed the time outside walking. On the way back to campus, I further indulged by buying two more scarves at the shop by West Gate; their beautiful scarves, only10 kuai ($1.30) each, are definitely a guilty pleasure for me here. This evening I was running late for dancing so I got chuar (barbecue, kind of) to-go. Two sticks of chicken, four quail eggs, and two sticks of potato slices, all cooked in spicy soup and heavily seasoned. I ate as I walked through my beautiful campus, sipping on warm milk tea with tapioca pearls, wearing my new warm winter coat and listening to Christmas music (I know, right?) – one of the best dinners I’ve had in China. Dancing was fun, but I felt a little bit out of it. I found out today that the first of my ex-boyfriends is engaged, which makes me feel very old! I feel like time has stopped for me since I came to China, while it has continued ticking for everyone else. A lot of things contribute to this – the 13-hour time difference, the lack of familiar seasons, the foreign pattern of school semesters, etc. – and today it made me feel really melancholy. But then, as I was sitting on the couch feeling old, I looked out at my Chinese dancing friends, who were in fine form today – unusually social and friendly – and thought that maybe being old isn’t so bad after all. After dancing, I had the pleasure of witnessing someone else getting set up with someone’s kid. Lester, my Filipino 帅哥 (good-looking older brother; hottie), is #1 on the potential son-in-law list of every Chinese woman in the dancing group. They were talking about one woman’s daughter, who conveniently is the same age as Lester, and quite obviously trying to set up a date for her with Lester. Lester’s Chinese isn’t as good as mine, though, so he just kept nodding in that way we foreigners do when we don’t understand what’s being said. Eventually I started acting as interpreter, to save him from getting into something that he didn’t want. The women are taking him out tomorrow and I’m not going to be there, so I told him to stay sober, not to sign anything, and listen closely for the words 女朋友 (girlfriend) and 老板 (spouse). Can’t wait to hear how that turns out! I’ve spent much of the day packing and otherwise getting ready for Shanghai. I leave tomorrow morning and will be back sometime on Monday (they bought my tickets, so I’m not super clear on the details). Again, I won’t have my computer, so don’t expect any big blog posts. Please pray for my deacon, all others getting ordained this weekend, and all clergy throughout the world! I usually try to schedule my adventuring, especially culinary, a certain time after waking. I’ll eat pretty much anything – just after noon. This morning, however, I got started early. I met two friends at 7 for breakfast in the cafeteria – the first time for all of us. I had some scrambled eggs (cold), potatoes (freaking delicious), baozi (quite good), 油条 (literally, “oil sticks” – kind of like unsweetened straight donuts? ), some sweet cake (nice and dense), and a yogurt drink. It was not bad! This evening, a Chinese friend 请我吃饭 (invited me out to dinner) for the first time. This was the friend whose personal statement I revised, so this was her way of saying thank you. We ate a Korean restaurant and I got the chance to talk to her and her boyfriend. The most surprising revelation of the night was when I told her I go to school in Oklahoma. First, she said that she knew of a city named Tulsa (from a Friends episode apparently?) and then she said she also knew there was a song with the same name. This is exactly two more facts than any other Chinese person I’ve met (three, if you count the fact that she knew it was a state), so I was quite impressed. I went dancing this evening. I had a wonderful time, but the evening didn’t really end well. Karolina, Lester, and I were hanging out talking to one of the women afterwards, and I noticed that Smelly Man was hanging around – not talking, just watching us. Smelly Man is perhaps my least favorite person in China; In addition to having no sense of rhythm when dancing, he smells like an old cigarette, which is how he got the name. I purposefully waited for Karolina so we could walk back together, and we went a different direction when we saw that he was walking ahead of us along our usual route. Later, those paths intersected and we again went another way, going into a supermarket to do some shopping. After about 20 minutes of shopping, I figured he had left . . . Then, Karolina and I were parting ways – me headed the 20 yards to my dorm and her the several-minute walk along poorly-lit streets – and I saw him again, just yards ahead of her. I called out to her and asked her to come with me because I had something to show her; she was confused but she came. When I told her I had seen him, she was really thankful, though! We looked over at him together and he saw us looking, but I don’t care. I’m not sure that really feared physical danger, but it was absolutely, definitely 奇怪 – strange. I know I can buy brass knuckles at the mall, but I’d settle for some mace. At the Shanghai forum, Mr. Obama was asked only one question — “Should we be able to use Twitter freely?” — that delved into an area the Chinese government considers controversial. His cautious answer stood out as a sign that he hopes to reach China’s youth without offending its increasingly influential leaders. He delivered an oblique critique of China’s rigid controls and restrictions on the Internet and free speech without mentioning that China practices online censorship as a matter of policy. That snippet, at least initially, captured the attention of Chinese netizens. It was a topic of discussion on Web sites for a couple of hours after Mr. Obama spoke, before being deleted or removed from prominent positions. According to several Web snapshots in the hours after the meeting, “What’s Twitter?” and “Obama Shanghai” shot up to the list of Top 10 Chinese Google searches. The Eucharist, sacrament of communion, source and summit of ecclesial life and evangelisation, is at the centre of your journey of reconciliation. The Eucharist, even if celebrated in a particular community, is never the celebration of that community alone. A truly Eucharistic community cannot retreat into itself, as though it were self-sufficient, but it must stay in communion with every other catholic community. In fact, every celebration of the Eucharist presupposes the union not only with the local Bishop but also with the Pope, the order of Bishops, all the clergy and the entire People of God. The article referenced several times the letter that Pope Benedict wrote to the Church in China two years ago. I remember reading it before my second trip to China, but I decided to go back and take another look. Again, I interpreted it very differently because I identify so much more with the people to whom the letter was addressed. One of the most interesting things for me was the establishment of May 24th as an international day of prayer for the Church in China. I remembered the date (as it happened to coincide with my first day in China last summer), but not the reason. 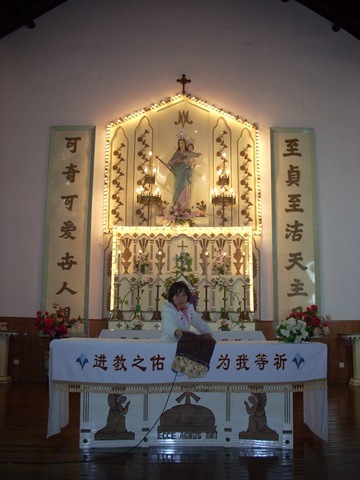 Apparently that day is the “memorial of Our Lady, Help of Christians, who is venerated with great devotion at the Marian Shrine of Sheshan in Shanghai.” The name Sheshan sounded familiar and sure enough, it is the pilgrimage site that I will be going to in Shanghai when I go with my church next month. A little looking on Wikipedia told me more: it is, among other things, the largest Christian church building in East Asia, and the only active pilgrimage site for Roman Catholics in China. Sweet! Anyway, if you would like to read the entire letter, I would encourage you to do so. It is kind of long, though, so I’ve selected some of my favorite parts – just click below (the Comment and Read More button).